When is the right time for lawyers to purchase an ERP? Founders Professional is a national wholesale insurance brokerage focused exclusively on the placement of professional liability insurance. We have extensive expertise in Architects & Engineers, Cyber, Technology, Financial Institutions, Lawyers, Healthcare, Management Liability, and Miscellaneous Professional lines. • An attorney is leaving a firm and they want to make sure their past work is protected regardless of the insurance decisions that their former firm makes after their departure. • A law firm or attorney has had a gap in coverage and they want to fill that gap. Those are just a few examples, all of which we have worked on and placed coverage for. If you find yourself in need of a solution for one of your law firms in need of different ERP options, then please come to Founders Professional. We would be happy to help. I might be interested in pricing for a stand alone tail for an attorney client of mine. 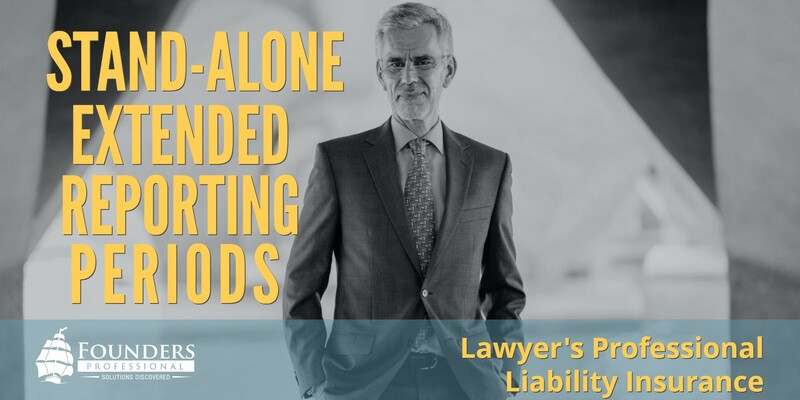 If a lawyer is leaving another firm his work there is covered, is it not? It’s covered as long as that firm he’s leaving keeps the policy in force. If they don’t then that lawyer is no longer covered.